The market has continued to grind within the noise zone -- but there is now the potential of a near-term problem developing for bears. There have been several attempts at the 1561-1564 zone, and the more times support or resistance is tested, the weaker it becomes. In the case of resistance, eventually the overhead supply of sell orders is exhausted -- and once the balance shifts to where there are more buyers than sellers, the law of supply and demand leaves the market no choice but to head higher... at least until it runs into a new layer of supply. This is the reason there are no officially-recognized "quadruple" top or bottom patterns in classic technical analysis (to my knowledge, this pattern is only recognized in P&F charting). Shorting the first retest can work, shorting the second retest can work -- but shorting the third retest is usually a losing play for more than a quick trade, because odds are good that the market has already chewed through most of the sellers at that price level. In other words, bears are basically facing their "final stand" at these levels. 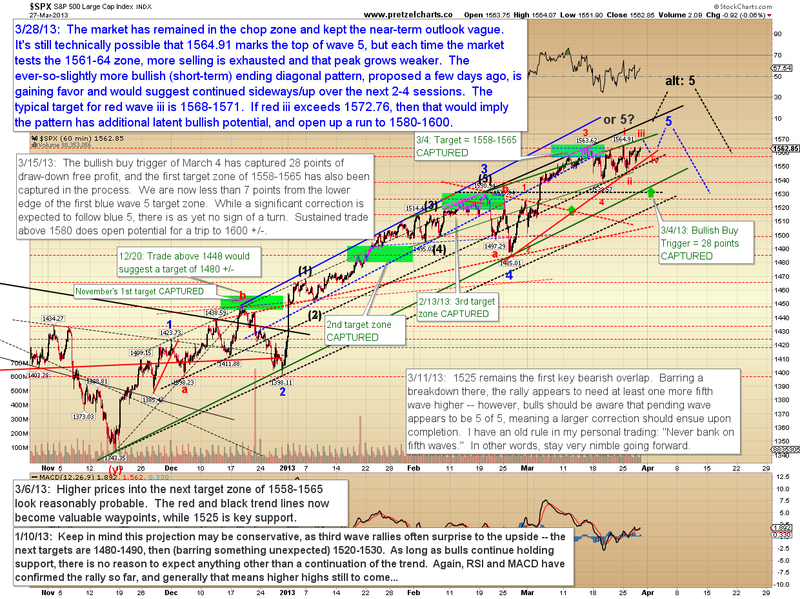 Another thrust back up here, and the sellers will likely become overwhelmed, at least for the near-term. In regards to the intermediate-term, there has been no change in my outlook and, unless there is a material change in the market's behavior going forward, I continue to feel this is the final leg of the rally before a larger correction. The challenge of the past few sessions has been in trying to determine how we'd get there, and the market really hadn't been giving me too much to work with in terms of clarity. Things are finally starting to clarify, though, and for this update I have a number of potential targets, as well as some key levels which would suggest progressively higher price targets if crossed. There's now one obvious pattern in the near-term charts, and this is the pattern many technicians seem to be watching; it's called an "ascending triangle." In classic technical analysis, this is a continuation pattern, and suggests a target of 1588-1590 if the market breaks out above the upper boundary. While I can't be certain, I suspect that pattern may not play out as most are expecting. I'll explain the pattern first, then I'll explain what to watch for to determine if it's "working" or not. Of course, the first thing that needs to happen for this pattern to have any validity at all is the market needs to break 1565 -- if that fails to happen, then it's a moot point. 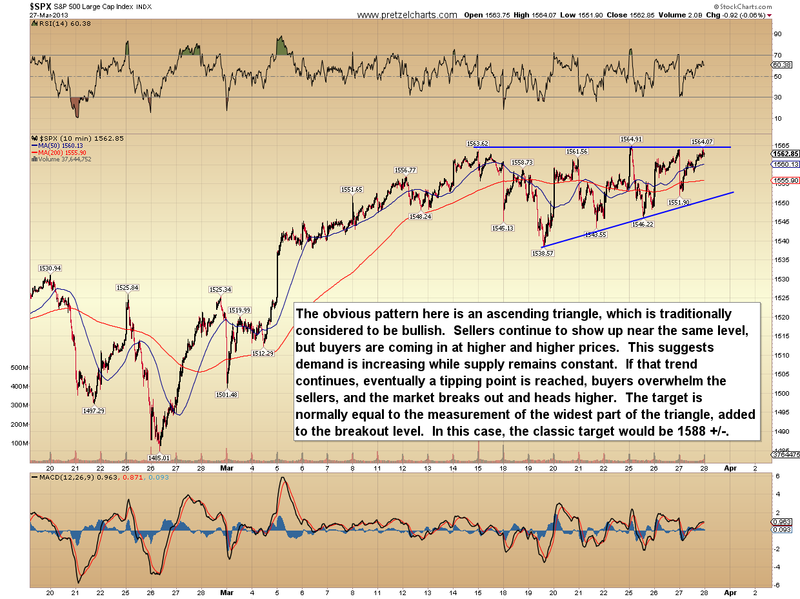 While the triangle is more obvious, I'm still inclined to favor the idea that a top is closer than this pattern suggests. There are two near-term options for bears here: the first is that the prior high holds and the market continues lower immediately. The second is a pattern I mentioned a few days ago, called an ending diagonal. 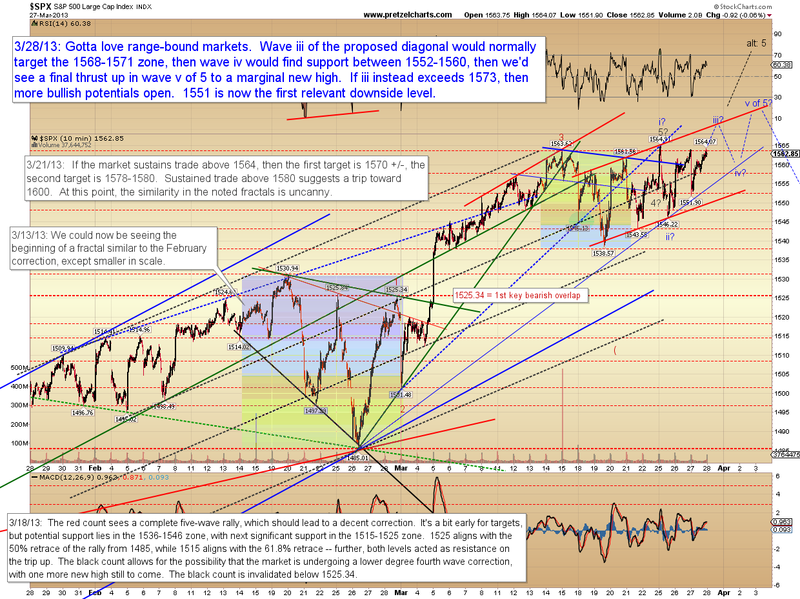 If 1565 is broken, the diagonal will become my odds-on favorite, with the next target (for wave iii) being 1568-1571. If the market then goes on to break 1573 during wave iii (on the chart below), I will then be sold on the ascending triangle pattern discussed above and be inclined to favor a trip to 1580-1600. Unless that happens, though, I think the diagonal shown below (or the more immediately bearish count) is more probable. The hourly chart notes a bit more detail on some key levels. The most immediately bearish count continues to remain on the table until the market reclaims the prior high. In conclusion, while numerous possibilities remain viable as of this publication, the market has now clarified enough that we have some key near-term levels to watch -- and this should at least give us an edge in determining the market's next target of higher probability. Trade safe. Just broke 1565. To infinity and beyond!!! Hi, i feel that i noticed you visited my web site so i came to return the favor? .I am attempting to find things to enhance my web site! I guess its good enough to make use of some of your concepts! I'm going to book mark your website and keep checking for new details about once per week. I opted in for your RSS feed as well.